I've written before about water at our place, but I thought now was a good time to get into more detail after I read a post about the same topic by Frugal Queen. She was talking about saving town water, but we have a slightly different focus. As you know, we are not on town water or sewage, so we have to manage our water use very carefully. 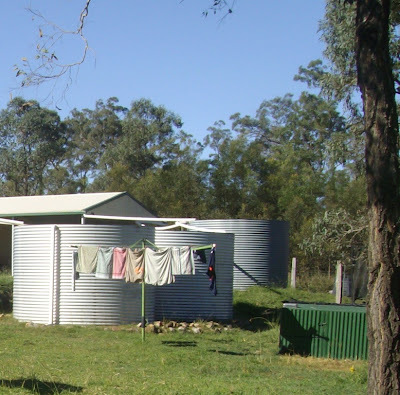 We have 3 22000 L water tanks that collect water from the roof of our house and our shed, and our waste water drains into a large underground septic tank, which has to be emptied every few years. We use all our bath and washing machine water on the garden. We built a system to drain the grey water into a drum under the house and then pump that up to the garden, this would be even better if the garden was downhill from the house and the water could just gravity feed straight to the garden. Using the grey water on the garden means that we don't fill up the septic tank so quickly, and we always have plenty of water for the garden. We only do the washing up once a day at the most. We did have a problem with ants getting into the dirty dishes, but we solved that my leaving the water in the second sink and stacking all the dirty plates under the water so the ants can't get them (In Australia it is common to use two sinks, the first one with the detergent and the second to rinse). We only wash clothes when they are really dirty. I wear the same "farm clothes" - jeans and shirt - for afternoon chores all week, I wear the same work uniform - jeans and shirt again - all week and then I have clean inside clothes that I wear all week too. If I do go out into town in nice clothes, they usually get put away again unless they are dirty. Farmer Pete wears overalls to work because work washes them, so that saves heaps of dirty work clothes. We only wash towels and sheets when they are really dirty. I used to wash all towels and sheets once a week, but when we got really low on water and were trying to get away with only one wash a week, that was something that we decided we could stretch out longer, clean sheets are a real treat now! We don't wash things with water unless they really need it - like the house, the car, the veranda, they only get washed if they are really dirty, and then only with a pressure cleaner, which uses less water overall. The most wasteful use of water in our house is running the hot tap in the kitchen, it takes forever to get hot because the hot water cylinder is on the other side of the house, this is TERRIBLE design, the hot water cylinder should always be closer to the kitchen, as it has more on/off tap use than the bathroom. Anyway, when the tanks get really low we keep a jug in the kitchen and fill that when we are waiting for hot water, then it gets used for cooking or watering the garden. Another thing that we do, that people find a bit weird, is we leave the bath water in the bath all day. This means that if we need to wash our hands or need water to clean something, we can just use the old bathwater, we then drain it into the drum under the house for the garden water when its time for the next bath. Of course that is only the water for the house, we also have dam water that we use for the cattle. And we are hoping to get some bores at Cheslyn Rise for added water security. What are your weird water habits? Like you Liz, we have to harvest all our water. 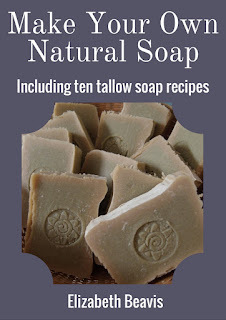 We practice all the same strategies you use to save on water usage, but do wash dishes twice a day in minimal water (no need for rinsing though, as I use home-made soap - not detergent with all the nasties). We also have a bucket in the shower to catch the first 4 or 5 litres of cool water before the water is warm enough to hop under. This is then used to fill up the Durand water filter (bought as a necessity when we had to live in Mt Isa, Queensland for a few months). This water is then used for drinking/cooking. This strategy also reduces the load on the water pump, so hopefully will extend its life as well. When we built our house we had the plumber install a water metre on the house side of the water pump (the type the councils use to bill you for water usage in suburbia). This allows us to keep a check on our usage. We read this meter once a year and the first year we used an average of 814 litres per week for three people plus the occasional visitors. This is not quite 39 litres per person per day (pp/pd), excluding visitors. I thought this was a bit excessive and am truly amazed when hearing local councils congratulating people for only using 140 litres pp/pd in times of water restrictions! The second year our usage had crept up to 840 litres per week (40 litres pp/pd) which told us some frivolous habits must have crept in and, after changing our ways a bit, last year saw our usage drop to 748 litres per week (35.6 litres pp/pd). Water, like all natural resources, is finite and should be treated with respect and not taken for granted. It’s a pity all children in the western world are not taught this from an early age. Thanks for your post, very informative. We live out of town, but just close enough to still have town water. First thing we did when we moved in was putting in a rainwater tank and are already planning on a second one. (This is a great tool for kids to become more water wise, they are now also coming into the habit of knocking on the tank to check the level). Next on the list is to dig a dam, to water the cattle that we one day hope to have. All wastewater now goes into the septic system, but I would love to divert most of it towards the garden, last year it felt silly because most plants were drowning as it were, this year has been very dry and I need more water then the rainwater tank can provide. Unfortunately I am a wasteful towny. I hate to think how much water I use. Actually, I find out every quarter when the bill rolls in. I make all the excuses. Your list of habits is very useful and helpful. Thank you. Even though we have access to all the water we could use living in the city I thought it the right thing to teach our kids to be conservative. We have installed 3 water tanks - for the garden and toilet flushing. I also insist on short showers and low baths. Our washing machine uses minimal water but still we limit the loads by wearing our clothes for more than a day when practical. Thanks for the great tips on saving water. We're in WA, on irrigation water, not potable but connected to house. Rainwater for drinking and cooking. We need to use more than three times what we do or there is a chance that they will cut our allocation. So husband says we need to leave some taps on to get the usage up because once gone we wont get it back and we will need it all in a few years time. How insane is that! 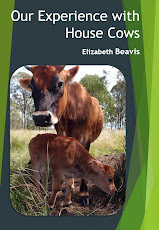 We are a bit like you Liz except that we have bore water that feed our toilet and washing machine and because of that we never get low on water, well not in the last 3.5 years. Even still we live like we could. Because I work from home I fill the bathroom sink and use that all day for hand washing. In the kitchen we have a dishwasher that uses 17 litres for the entire wash which is less that if we did a few days worth by hand because our water takes ages to heat too. I'm in town so have unlimited water supply but do like to think about how much I'm using. I'm aware that every drop of water coming from our tap has been processed before it gets to me, and every drop will get processed again when it goes down the plug hole. Dwelling on that helps me to make better water decisions, like flushing the toilet less often. Reading your list, I realise I'm still very wasteful with water though. I've posted a link to our bathtub vege gardens. With a bucket under the 'drain hole' (where the plug would go), the same water can be used several times over. If that water used on the bathtub veges, initially came from the kitchen sink (we have a tub that fits the sink nicely), then it's already been reclaimed once before it gets to the garden. then it gets reclaimed over and over again while it's out there. Sometimes I empty it onto a fruit tree or a different bathtub garden, just to share the 'nutrients' around that come through. It's also a really quick 'I'm short of time gotta water the garden' and dump the water or, if you use a watering can to catch the water, then it's easy as to water gently for the more delicate things like lettuce etc. We also have olive barrels we have set up as our water 'tanks' (for space and because of the upfront cost of a larger tank). They work well but aren't anywhere near enough for the garden. We have 6 more waiting to be rigged up. that said, even though our water use for our family size is pretty reasonable, we could still do more. Thanks everyone, lots of good tips here and good to hear that even the city folk are trying to conserve their water.